One of the favourite techniques used by regular weekly shows is to have an episode that plays with the underlying concept, so for example we have the Mirror Universe stories in Star Trek, or stories such as Superman II where the hero either looses or gives up his powers. Doctor Who has done similar concept breaking episodes at times in it’s history, and this week was one of those times, where we had a story where the Doctor wasn’t himself – indeed he wasn’t even the same race – as in order to hide from a group of aliens referred to initially only as ‘the Family’ he uses a device in the TARDIS called the Chameleon Arch that creates a new character and biology for him, allowing him to hide. His Timelord persona is safely stored away in a device disguised as a pocket watch ready for when he is able to come out of hiding. The episode, Human Nature is based on the 1995 book of the same name, however whilst a number of plot elements and character names are reused, the plot is somewhat changed. 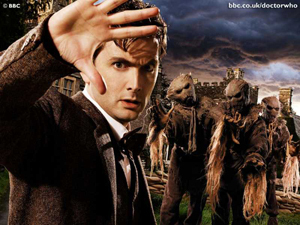 The basic concept of the Doctor becoming human, and the main location as an English public school in the winter before the Great War are retained, but characters are changed. For example the widow Joan Redfern who falls in love with Doctor John Smith becomes a nurse in the TV episode, whilst in the book she is a science teacher. The reason for the Doctor becoming human is different than in the book too. The episode operated on many levels. On the surface you have the story of the Doctor hiding from aliens who need the last of the Timelords, however as Beth pointed out in many ways it is a tragic story. Alongside the simple surface story one of the boys, Tim, appears to have telepathic powers and can see the future. Whilst these are partly in the main plot to allow him to see visions of Martha’s real life, he also at times gets premonitions of the impending war, including his death alongside a fellow boy from the school in an attack. There is also an element of tragedy surrounding Joan Redfern, who having lost her first husband is attracted to Doctor John Smith, but who you ultimately know will loose him as the personality and life are artificially generated and will disappear when the Doctor regains his previous character. The episode is also a great opportunity for Freema Agyeman to shine as Martha Jones. Doctor John Smith obviously doesn’t remember who she really is, and believes she is just his maid. Whilst the Doctor is blissfully unaware, except through strange dreams, of his true identity, she is tasked with keeping him safe, and if something goes wrong bringing him back, her only guide being a list of instructions that the Doctor has left behind in the TARDIS, also hidden away so as not to attract attention. Quite aside from having a great multi-layered plot, we also have some nice moments for the fans. Doctor John Smith has been keeping a journal of his strange dreams, and as he shows Joan the notebook, we see pictures he has drawn of creatures from the new series, but then for the first time an on screen acknowledgement of the previous series with the journal including images of many of the previous Doctor’s. Later on when Doctor John Smith is talking about his family he mentions that his parents are called Sydney and Verity, acknowledgement of Sydney Newman the Canadian TV producer who created Doctor Who, and Verity Lambert it’s first producer. All in all I thought it was one of the best episodes of the new series, nicely evoking the atmosphere of the period, along with some scary badies whose traits were more unnerving compared to the cringe-making give-away of the Slitheen. Amongst all of that you also had a noticeably different character in Doctor John Smith at the centre, who even when he is confronted by the badies in the cliff-hanger, still can’t remember who he is. Great stuff, and I’m now really looking forward to the conclusion next week. Hints about that episode seem to imply that ‘the Family’ are part of a bigger plan. Part of the Mr Saxon story arc? We’ll have to wait and see.